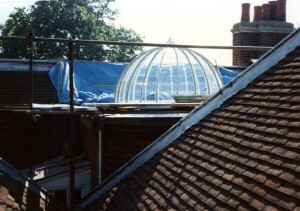 (left – the dome before restoration, covered by the ‘greenhouse’, itself deteriorating badly) Owen Hay wrote … “The photos (below) show the completed dome after it was re-glazed by Kent Blaxill and Co Ltd in 1989 at which time I was General Manager of the Glass Division, a position that gave me the opportunity to visit places and see areas of buildings not seen by the general public. 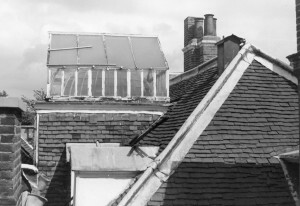 It was always a pleasure to visit historic buildings, such as Grey Friars, and appreciate what the craftsmen of the past could achieve without the benefit of modern equipment and see how the buildings survived the many changes of use they had experienced. 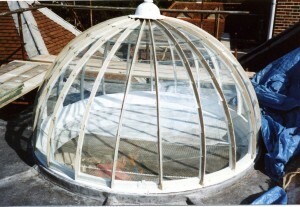 Although the dome would have been glazed originally with curved glass to match the frame the photos show that it was re-glazed with flat glass, no doubt a cost cutting decision, but not an easy task. 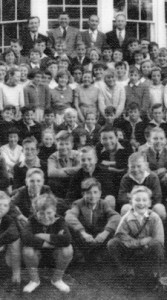 Another temporary pupil resident, Ron Abbott wrote … “Reading with interest about Grey Friars, my memories were stirred to a time when I was there for a couple of years 1959-1961. I and other St James C of E School pupils went to up the hill as first year pupils. 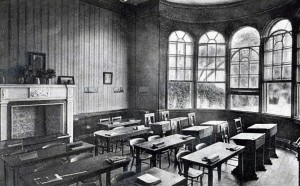 And because St James School (founded 1859) was a very old style building with just two classrooms, moving to Grey Friars really did feel like I was going to a ‘Big’ School. Of course my time there was only temporary while waiting for the new school to open on the Monkwick Estate, a Secondary Modern as it was then called (Monkwick, then Thomas Lord Audley). 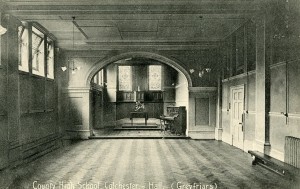 I had mostly good times at Grey Friars and my form class (1W) room for registration and some lessons was actually the one on the ground floor with the big bay window as shown in the Gazette picture. My actual desk, which was one with a double bench seat which I shared with a boy who was born in Singapore, (I’m sure his name was Patrick) was situated at the back of the room to the left side of the large marble fire place, when looking from the Teachers desk. The form teacher was Mr Woods, he also took the maths classes and was known for inflicting punishment in front of the class with a thin cane to the buttocks if you did something wrong. The building was, as I remember, often cold and draughty particularly as wearing short trousers was part of the uniform for first year pupils. On the upper floor there was a hinged ventilation door, to a dark void built within the outside wall that would sometimes blow open. And although it was probably just the draught that caused it to open, ‘the boys’ would tease the girls by telling them that there was a ghost in there. So if it did blow open just as any girls were going past, there would be lots of screams from them and this would make the boys laugh. The assembly Hall seemed very large to me at the time I was there, but on returning for the open days, before Grey Friars finally closed, it did not seem so large. But I guess that is a common deception when going back to childhood place as an adult. The outside areas consisted of a teachers’ car park, very cold toilets that in winter would freeze solid so there was no water to flush them. The playground sloped away from the back of the building which provided a great slide when there was snow and ice on the ground. I remember that when sliding down on the ice you had to get off quickly at the bottom end otherwise you would get knocked down by the next boy sliding down or bashed up against the red brick wall at the bottom of the playground. The teachers did not seem to worry about the dangers and with some of us still in short trousers there were a few grazed knees by ‘going home’ time. No health & Safety rules in those days.